Marc’s passionate about fostering the European digital health investment ecosystem, with a particular focus on bringing together investors and entrepreneurs as well as innovators from the Life Sciences industry through Insights – Introductions and Investments. Marc is currently advising large investors with regards to investment in digital health growth companies. Of particular interest are high potential European digital health solutions that can scale globally; solutions for patient monitoring and engagement in chronic disease management, virtualization of care delivery & care relationships, solutions for behavior change combining personal health and behavioral data, AI, and dynamic, personalized incentives, connected diagnostics, and “digiceuticals”. Marc has 20 years of experience working with the Life Sciences industry, information enabled business models (IMS Health), Life Sciences management consulting (Accenture), and biotech (MerckSerono). Most recently, Marc was responsible for M&A and digital health partnerships at Oracle Health Sciences, where his involvement ranged from projects such as the acquisition of ClearTrial and the partnership with Greenphire to Oracle’s investment in Proteus Digital Health. Marc is a Dutch national living in Switzerland; he studied Business Administration at Erasmus Rotterdam (Netherlands) as well as in Aix-en-Provence (France); he speaks English, French, Dutch and German. 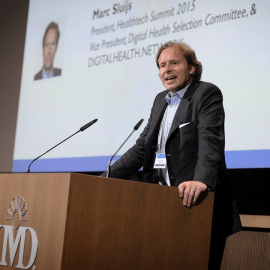 You can reach Marc at marc.sluijs@digitalhealth.network.